By vintage we mean Armagnacs from the same year taken from different barrels and varietals, or sometimes a single varietal, and blended together to express the best of that year, at the time it is bottled. Each year expresses the characteristics of that year, of the harvest, of the wine of that year. And each is different and evolves at its own pace. Some vintages take several years before they open up, other are exceptional when young. Each therefore requires close monitoring and constant attention. The year itself has of course its own characteristics, and there are also influences from several different factors, such as the different varietals, the differences in the barrels (seasoned, new, toasting – strong – medium and low), which give rise to an infinite number of possibilities in the aromas. Every year the vintage is blended and bottled in keeping with sales, and otherwise continues to age and develop in the barrel. A vintage bottled in 2010 will have 7 years less barrel time than the same vintage bottled in 2017. That is why the year it is bottled is stated on the back label. When blends are over 30 years old, they generally go into glass carboys that are stored in a special cellar called Paradise – “le Paradis”. Each vintage year is bottled at its natural alcoholic degree, with no reduction, which is known as “brut de fût”. That means that nothing is added – no woodsy products, no caramel, no sugar, no colouring – all of which are authorised by the appellation rules, but all of which are used to mask any defects in a poor-quality Armagnac. These additives can also be used to make a given Armagnac more uniform. Château de Lacquy Armagnacs are not standardised by such additives. 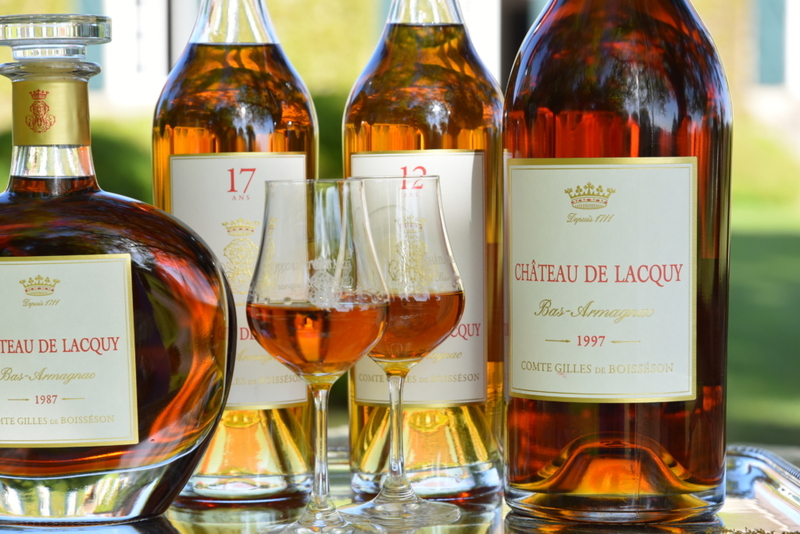 This means that each vintage year at Château de Lacquy is unique and gives Armagnac-lovers an infinite source of tasting pleasure as you compare different years.